William P. Crowell is a Partner at VC firm Alsop Louie. He is also an Independent Consultant specializing in Information Technology, Security and Intelligence Systems. He is a director at SafeNet, Inc., encryption, data protection and authentication solutions, which is in the process of being acquired by Gemalto. He is also a director at DeviceAuthority, device authentication; SAP NS2, a subsidiary of SAP; and Toopher, multifactor authentication. He is Chairman of the Board of Centripetal, a startup in the rule-based packet gateway and filter area. Until its acquisition by Cisco in June 2007, he was Chairman of Broadware Technologies, a video surveillance software company. He was also a director at ArcSight, Inc. (ARST), which was acquired by HP in October 2010; Narus, Inc. which was acquired by Boeing in July 2010; Six3 Systems which was acquired by CACI in November 2013, Air Patrol, wireless network security company acquired by Sysorex in May 2014, and Fixmo, Inc., a mobile device security company acquired by Good Technologies in June 2014. Crowell served as President and Chief Executive Officer of Santa Clara, California-based Cylink Corporation, a public company and leading provider of e-business security solutions from November 1998 to February 2003, when Cylink was acquired by SafeNet, Inc.
Crowell came to Cylink from the National Security Agency, where he held a series of senior positions in operations, analysis, strategic planning, research and development, and finance. He served as Deputy Director of Operations from 1991 to 1994 running its core signals intelligence mission. In February 1994 he was appointed by President Clinton as the Deputy Director of NSA and served in that post until his retirement in September 1997. From 1989 to 1990, Crowell served as a vice president at Atlantic Aerospace Electronics Corporation, later acquired by Titan Corp, leading business development in space technology, signal processing and intelligence systems. 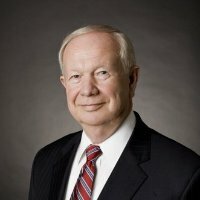 In April 1999, Crowell was appointed to the President’s Export Council (PEC), which advised the administration on trade and export policy. After 9/11, he served on the Markle Foundation Task Force on National Security in the Information Age, which published three landmark studies on Homeland Security and information sharing. He has also served on numerous panels to investigate and improve military command and control, intelligence and security systems and served as Chairman of the Director of National Intelligence (DNI) Senior Advisory Group from 2007 – 2014. Crowell is an expert on network and information security issues. In December 2008 Security Magazine selected him as one of the 25 most influential people in the security industry. In May 2007 he co-authored the book, “Physical and Logical Security Convergence,” published by Elsevier. He has been quoted in many trade and business publications including the Wall Street Journal, Business Week, USA Today, Information Week, Network World, Computer World, Federal Computer Week, CIO Magazine and the San Jose Mercury News. Crowell has also appeared on CBS MarketWatch, CNET News, CNBC, and The Charlie Rose Show. He was the technical advisor to the TV series, “Threat Matrix” during its run on ABC in the 2003 season.